One of the last films to be co-funded by the UK Film Council, which is in the process of being disbanded by a goverment that wants the UK film industry to concentrate on creating international hits, The King's Speech has, rather embarrassingly for these idiotic politicians, become one of the most beloved and successful films of the year, storming the international box office and attracting widespread critical praise. It's also landed a wealth of international awards, including 12 Academy Award nominations and four key wins (Best Film, Best Director, Best Actor and Best Original Screenplay), seven BAFTA Awards (Best Film, Leading Actor, Supporting Actress, Supporting Actor, Outstanding British Film, Original Screenplay and Original Music) and a Golden Globe Best Actor Award for Colin Firth. 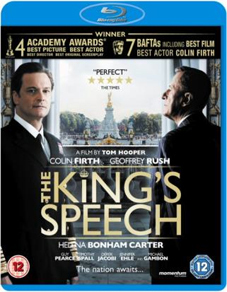 Based on the true story of King George VI's epic journey to overcome immense personal difficulties on his way to the throne, The King's Speech explores the touching and intricate personal relationship between a reluctant king and the unconventional speech therapist, Lionel Logue. With the threat of the Second World War growing on the horizon, the king must discover hidden worth to become the voice of, and inspiration for, the nation. Directed by Emmy Award winner Tom Hooper (John Adams, The Damned United), it stars Golden Globe winner Colin Firth in a career-defining performance as Prince Albert, alongside his Shakespeare in Love colleague and Oscar winner Geoffrey Rush as speech therapist Lionel Logue. The supporting cast includes Helena Bonham Carter as Queen Elizabeth (later the Queen Mother), Guy Pearce as the abdicating King Edward VIII, Derek Jacobi as the Archbishop of Canterbury Dr Cosmo Lang, Timothy Spall as Winston Churchill, Jennifer Ehle as Logue's wife Myrtle and Michael Gambon as King George V.
Photo gallery including A Look Behind The Scenes.